This is my first project from my stash reHash haul. It's also my first knitting project in a long time! I had thought about making myself a cardigan, but was concerned it was a bit too ambitious. 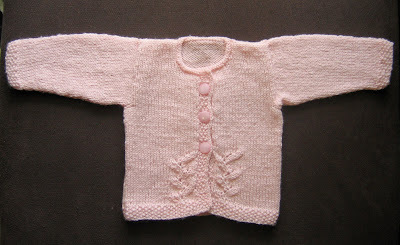 So I made a baby cardigan for my friend's gorgeous wee baby girl Brook. I'm really pleased with how it turned out. I had to google casting off to refresh my memory, but everything else came back to me without too much trouble. Now I just need to find some yarn to use for my next project, this gorgeous cowl from phydeaux. The cowl looks lovely! Might have to make one of those for myself...if I get the time!